I have the documents from MARKUUPILOT with the overall size of the PFD, ND, bezel, but i'm not finding the specific width of the bezel. I have marked the inserted image with two locations, A & B. Can someone with a OEM 738 MIP assist with measurements? Actually it's not an OEM MIP you're after but an OEM DU. Perhaps someone from maintenance or a helpful pilot can give some guidance on your question. Actually the bezels and glass on my MIP are real. If you need any other measurements let me know. Forgot to ask, but what does the top of the bezel and the gaps between the bezels measure ? D=5mm As for the gap, remember that these are slide out units so that is going to be a little different on every set. Mine are right together so I can not help much. Thanks Bob. I just literally became aware the DU's slide out with the bezel attached (reading Flaps 2 Approach site). I'll probably set the gap somewhere between 2mm and 4mm. 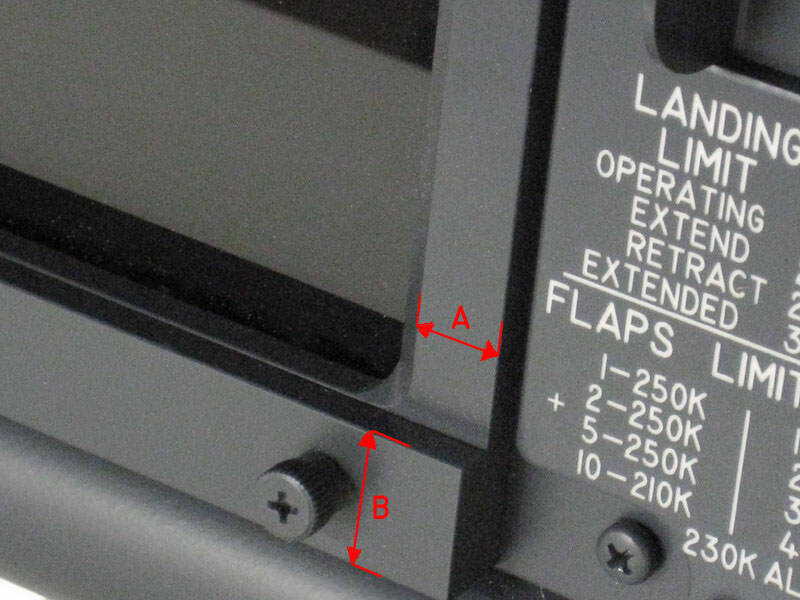 If you are OCD like me, gap is 1/16th (Boeing use imperial measurements) or 1.6mm. Page created in 0.458 seconds with 24 queries.